reat listing! 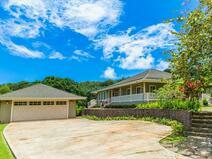 Beautiful home on acreage with lovely ocean views situated on the eastern side of Kauai, Aliomanu Estates is a hidden gem located in the perfect location allowing easy access to all sides of the island. Watch the sun and moon rise, listen to the sounds of the ocean as you fall asleep…relax in your 3 bedroom, 2.5 bath home with upgraded features such as a large marble open deck looking to ocean, granite counter tops, marble bathrooms, high ceilings, great light, lots of airflow etc…you are with in a short walking distance to the beautiful beach with great swimming. This is a life style property…come and enjoy!